More and more small local businesses are getting themselves a Facebook business page. The more small-businesses around on Facebook, the harder they have to work to be noticed. This is becoming increasingly competitive, so if your Facebook page doesn't stand out above those of your competitors, it's going to get lost in the craziness. We've been helping small business, Ed's Wood, get noticed in their local community via Facebook. 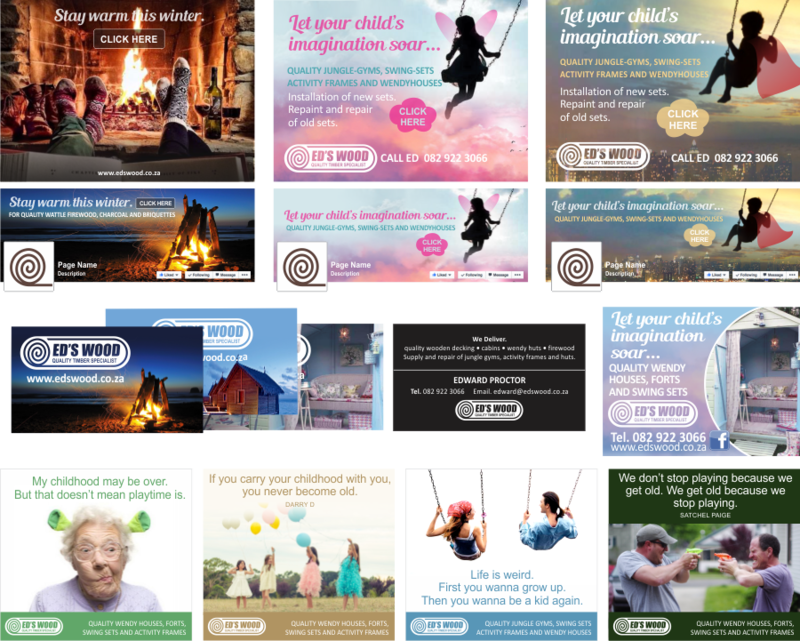 Ed's Wood sells quality wooden wendy houses (fairy wendys and forts), cabins, swings and play sets, decking, wattle firewood, briquettes and charcoal. There is quite a lot of work involved in putting together marketing material but it is a step-by-step process. We have a formula that we're working with and refining. If you start at the beginning and work consistently through the steps, in theory your page should acquire over 1000 likes within the first year of operation. For a small local business that's not too bad! We thought that we'd share some of what we've done for Ed's wood so far, including a set of Facebook cover images, adverts and quirky quotes. See the pics below which also includes their business cards and an advert for Mum's Mail. If you have hyperactive kids or pyromaniac tendencies, go along and like their Facebook page?